The shift to cremation is sweeping across the nation as families demand more affordable death care alternatives. 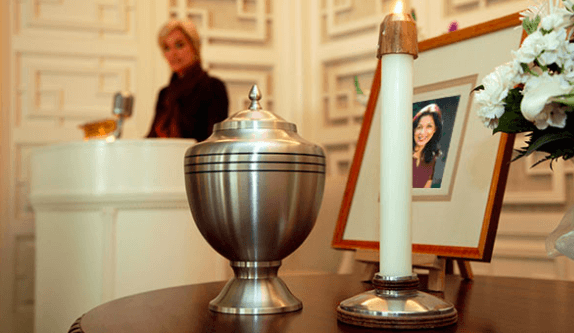 Cremation is now fast becoming a disposition choice for many families in Illinois. For those families who do not want to overspend on a funeral, or simply do not have the funds for a costly funeral, cremation is a low-cost alternative. What is the average cost of a funeral in Elgin? So how do cremation costs compare in Elgin? The average price for a cremation funeral service in Elgin is $3,225*. 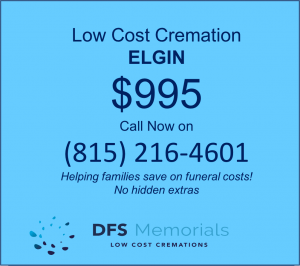 A basic direct cremation is available in Elgin for $995, although the average price for a direct cremation is $1,475. To help families arrange affordable cremation services we have selected only family-owned cremation services providers who can offer a basic cremation package for just $995. Direct cremation means a family can manage to conduct dignified funeral services for as little as $975. Are there are additional fees to the $995 cremation package? In order for a cremation to be conducted a ‘disposition permit’ must be issued by the county. At present there is no charge for this. Death certificates are an additional cost, as these are issued by the county, and are a third-party expense. Death certificates cost $24 for the first certificate and $4 for each additional copy issued. How do I know that I am getting the remains of my loved one back? This is one of the most frequent questions families ask about cremation. Strict laws govern the cremation of human remains and identity checks must be made all along the way. The cremation retort must be completely cleared following a cremation and only one cremation can be performed at a time. The remains are cleared into a machine that filters out any metal parts (tooth fillings, hip replacements) and then ground into the fine ‘dust’ that is returned as cremation ashes. Cremation is such a final disposition, you do need to ensure that you are completely sure that this IS the ‘right’ disposition choice for you. Certain laws are in place to ensure this final disposition can only proceed if the legal next of kin has authorized it. A Cremation Authorization Formmust be signed by the legal next of kin, and in the case of children, many funeral directors will require all children sign. It generally takes a few days to make the necessary arrangements, complete all the legal paperwork and schedule the cremation. However, expedited services can be arranged if required. In Illinois there is a mandatory 24 hour wait period after death before a cremation can be conducted. There is very little ‘free’ money to help families with funeral costs. What is available is constantly changing due to budget constraints, and varies by county. Some counties do have a provision to assist needy or low-income families. Contact Cook county DFCS to find out what may be available to you locally. There is also a $255 lump sum social security death benefit payment if the deceased qualifies, and your funeral director can help you claim this. 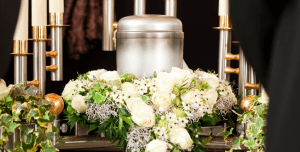 So you may find that a low-cost cremation at $995 with DFS Memorials is a dignified, yet affordable, disposition alternative if your family is struggling financially. If you have further questions about cremation, feel free to call us on (815) 216-4601 and we will be happy to try and help you. This entry was posted in Cheap Cremation, Finding a crematory or cremation provider, Funeral Planning, How to Save Money on Funerals, Medical Examiner and tagged affordable funeral, basic cremation, cheapest cremation, cremation costs, cremation plan, direct cremation, funerals costs, help with cremation by Nicole Pelling. Bookmark the permalink.